This is a tribute to my hero Norick Abe a big racing legend in Japan. On 7 October 2007 he was killed in a road traffic accident with a truck, which made a sudden illegal u-turn, while riding a 500cc scooter in Kawasaki,Kanagawa, Japan. Like everybody I also became fan of him after his wild card entry at GP500 in Suzuka where he impressed everyone by challenging for the win before he crash out with his extreme riding style. This is a helmet texture set of Norick Abe to use in GP500 Microprose. The contents are 3 helmet skins, the preview you can see here below. 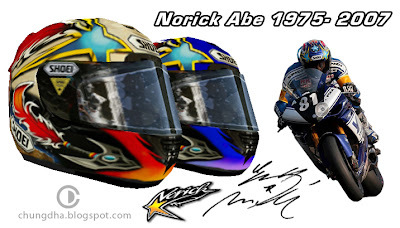 Norick Abe TC1 X-Eleven , TC2 X-Eleven and the helmet he used in 2007. All textures fits LaZy_tJaI Shoei helmet model. Condolences to the family and we will miss you Norick Abe. RIP NoriFumi.